You’ve probably heard of the Digg effect. You post something in your blog and somebody likes it. They digg it. Other people like it, and they digg it too. Somewhere along the line enough people digg it for a chain reaction to occur, and then hundreds, and later thousands visit your page through Digg. Great success. Apart from the lift in recognition your blog gets from the Digg effect you’ll also be on the receiving end of some less than attractive repercussions. Your blog/blook may be threatened. You may be hacked. Your server may crash (a lot of this depends on the way WordPress is built, so I’ll not go into the technicalities). But still many on the Internet regard the frontpage Digg as the holy grail. My question is this: how many pieces of online fiction get dugg? The answer (no surprise): almost none. I’m going to take a look at today’s frontpage (10th August, 2007) and categorize the top 30 stories that make it. These stories are selected by an algorithm that Digg changes from time to time – to keep things simple let’s just say it has something to do with the number of diggs (votes) in a period of time – and then we’ll see what this tells us about the Digg crowd in general. 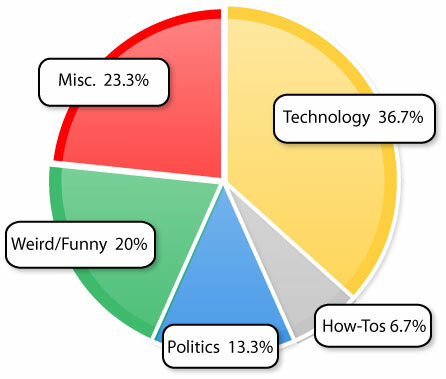 Predominantly technology, odd funny bits, and a dash of politics, right? No online fiction. So what exactly do these results have in common? 1. Relevancy. These links are usually on a broad enough topic, concerning a huge spectra of Internet surfers. There’s an article there today about Dell laptop shipping delays, and it ranks in at no.22, with 276 diggs. It obviously has this quality – why else would anyone want to read about laptop delays unless it affects their lives in some way? 2. Wow Factor. Or broad appeal. It is interesting to note that anything anti-Apple gets kicked off fairly quickly – which goes to show what kind of people hang around Digg. But generally stuff that blows your socks off makes it to the front page. Stuff that has high impact and quick absorption works the best. 3. Pictures. Lots of them. Big shiny ones. This applies particularly for the ‘small odd links’ that you find on Digg – the topic interesting enough to warrant attention, even if it is rather obscure. The best example of this is a wildly dugged link called The Strangest Things In Space. Space is obscure – not everyone’s interested in pictures of stars and distant nebulae, but in this case the pictures make up for it, and boosts the link’s appeal. So, for a fictional blog to replicate this success it needs either to be linked to thousands of other blogs, which it isn’t going to be, really, unless the story on the blog is so bleeding edge it is daily updated with relevant information that will lead it into search engines, or enough people tell their friends about it that they want to see what all the fuss is about (by, say, Digg or Stumbleupon). Now, I’ve never seen fiction get Dugg (? ), and it’s odd: why wouldn’t you want to recommend something you like? And it is odd, isn’t it? The thing about fiction is that it is relevant, but only after the first few chapters. Relevancy here simply isn’t obvious, especially in long form, episodic works. I can expect The Fake Steve Jobs diary to receive Digg-like traffic, but only because his posts are funny and standalone. The rest of us rant only after we’ve finished the book (or blook) in its entirety. And pictures! Pictures are idiot-proof content, but they do not make up the meat of a blook post. The wow factor in blooks goes without being said – when have you last shared online fiction with a friend, and then watch them laugh or go “Wow!”? The last time – for me – was this One Sentence Story. I’ll admit that there are many other factors that ensure online fiction rarely makes it onto the Digg frontpage – the biggest of which being the crowd Digg.com attracts (young Apple fanatics). But the Digg crowd is a good analogy for the rest of the Internet – what is popular there would probably be popular to the rest of the blogosphere. Is my content high impact, quick absorption? Now there’s a question we have to answer. 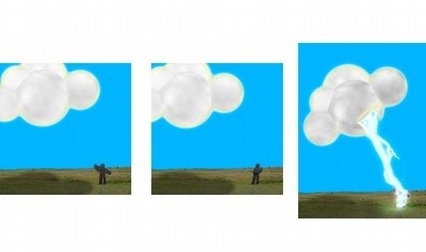 Note: The image of the Little Man and The Cloud (titled God, by the way) is the work of Jeff Siegel. Buy his art here.